There are many different ways to get to know the former Yugoslavia. You can watch documentaries, read history books or talk to someone who lived there. But, you’ll agree that the best possible option is to visit the region, if you get the chance. SFRY consisted of 6 republics and today, each of them carries some of its memories and symbols. However, if you don’t have time for a Balkan road trip, you could perhaps visit the core of it all. Belgrade, the former country’s capital, is packed with Yugoslavia-related memorabilia and remnants. We’ve prepared a list of things you must see if you’re interested in Yugoslav points of interest in Belgrade! One of the first things on your list should be the Federal Executive Council, or SIV, as Belgraders call it. It’s one of the most breath-taking buildings in former SFRY, and you’ll see why. This edifice used to be the seat of the executive body of the country and it’s still in good shape. It was built so that it demonstrates Yugoslav power and strength through architecture, with its 1,000 rooms and a luxurious white exterior. Unfortunately, it’s not open for visitors, but you might be surprised to know this is quite a museum on the inside. It is decorated with paintings, sculptures and tapestries from the most famous Yugoslav artists. Furthermore, there’s a salon dedicated to each republic, decorated so it represents its culture and tradition. Want to know the best part? World history was made in this building. This is the location of the first ever meeting of the Non-Aligned Movement, which still exist today. Tito and a few more leaders founded the movement and it’s still one of the longest-lasting movements that fight for independence. Today, the building is used for special occasions, such as presidential inaugurations and visits from foreign statesmen. 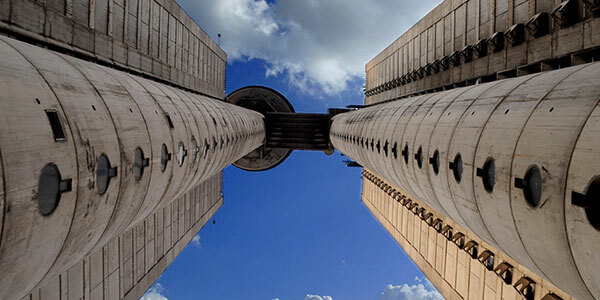 Make sure you head towards the New Belgrade municipality and visit this building. You never know, you might find yourself standing in the exact place Tito once stood in! To learn more about SIV click here. 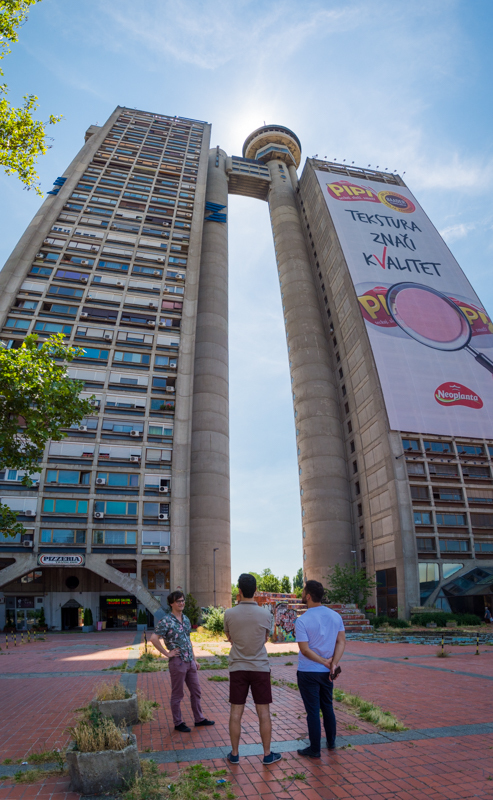 This high-rise has been a symbol of Belgrade and the Yugoslav brutalist architecture since the day it was built. It’s impossible to miss when you’re entering the city, hence its other name “the Western City Gate”. The Genex Tower actually consists of two towers. One of them is residential, the other commercial, but they are connected with a bridge. The idea was that it resembles a gate or an arch which welcomes visitors. Genex is just a name of a company that owned half of the building. The company doesn’t exist today, but the name stuck around. The exterior is an example of typical brutalist buildings built after WW2 in SFRY. The simple, naked aesthetic and the rawness of concrete make this an archetype of Yugoslav architecture. 38 years later, the Tower still dominates Belgrade’s skyline, just like it did back in the day in Yugoslavia. When you’re standing in front of it, it’s nice to know you’re looking at exactly the same thing Yugoslavs looked at. 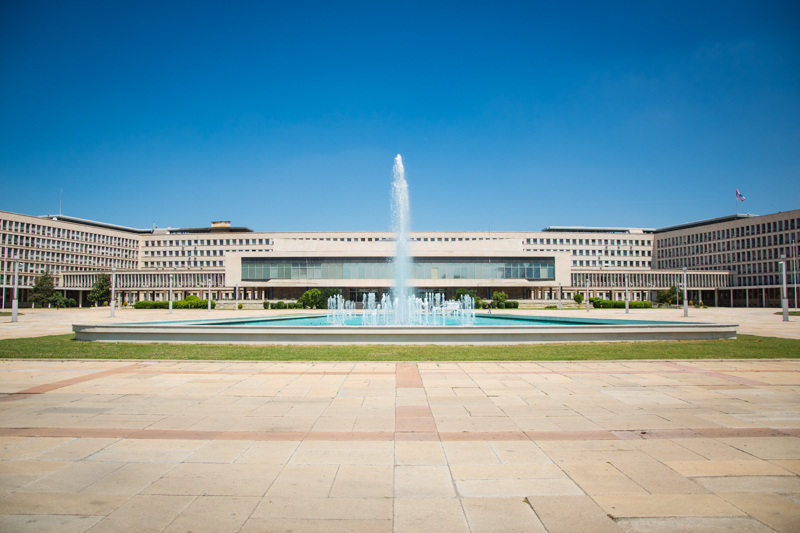 No changes, no renovations, just a pure masterpiece of communist architecture. The Museum of Yugoslavia is unavoidable on the checklist of every tourist who wants to know a bit about SFRY. Visiting this museum is a perfect opportunity to dive into the history of the country and the Yugoslav communism. You’ve probably at least heard of Tito, the most famous politician from this region. Josip Broz was the leader of the Communist Party and an overall Yugoslav icon. This museum tells the objective story of Yugoslavia under his rule and lifelong presidency. Other than that, this is also his and the First Lady’s resting place. Actually, Tito’s funeral was one of the biggest state funerals ever, with over 200 representatives attending. If you’d like to see their mausoleum, you need to visit the House of Flowers, one of the building in the complex. Since this is arguably the most interesting period of Yugoslav history, thousands of people come here each year to learn about it. Some of them are foreigners, some are younger generations of Yugoslav people that didn’t get to experience the era personally. However, you will always see very old people coming to pay respects to “the good days” as they usually say. The fact that this is the most visited museum in Belgrade tells you just how many tourists are interested in the former SFRY. Also, it shows that the locals are still very much Yugo-nostalgic. So if this museum is their choice, it should be yours as well. We highly recommend the guided tour! 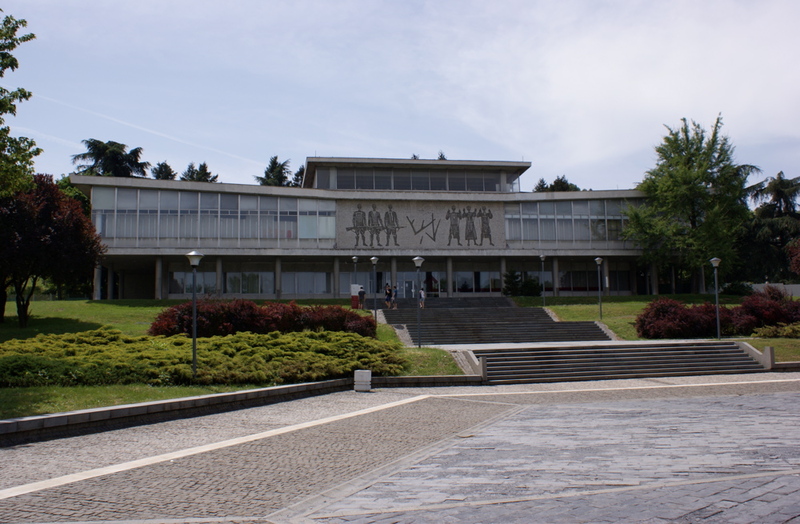 To learn more about the Museum of Yugoslavia click here. 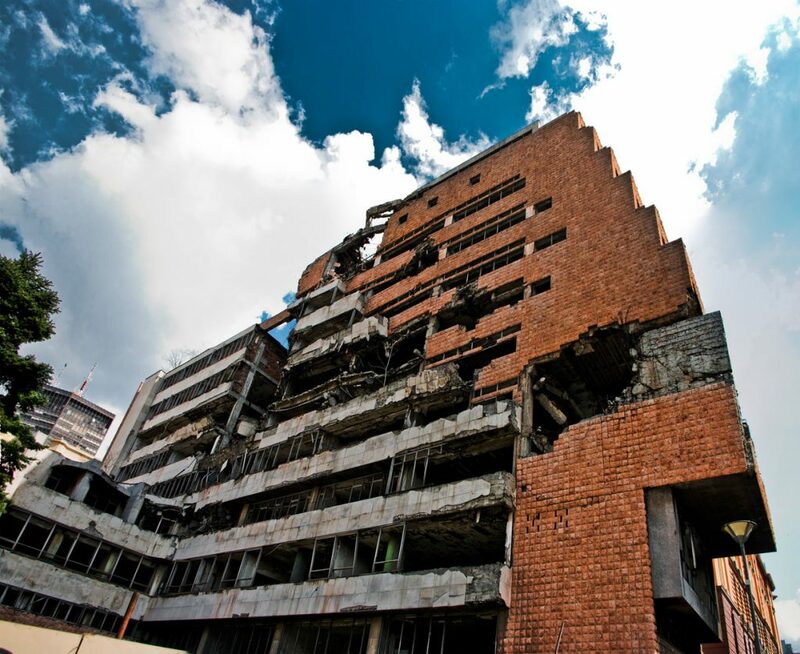 When we said ‘the remnants of Yugoslavia’, in this case we meant it quite literally. The Yugoslav Ministry of Defense buildings (a.k.a. The General Staff buildings) were heavily bombed by NATO in 1999. The complex still hasn’t been reconstructed and it serves as an eerie reminder of what the Yugoslav capital went through. It’s a shame that many don’t even remember these buildings as a whole, since they were truly magnificent. They were considered a first-class example of Yugoslav post war modernism. Interestingly, they were created to resemble the Sutjeska river canyon, where one of the most important battles of WW2 took place. 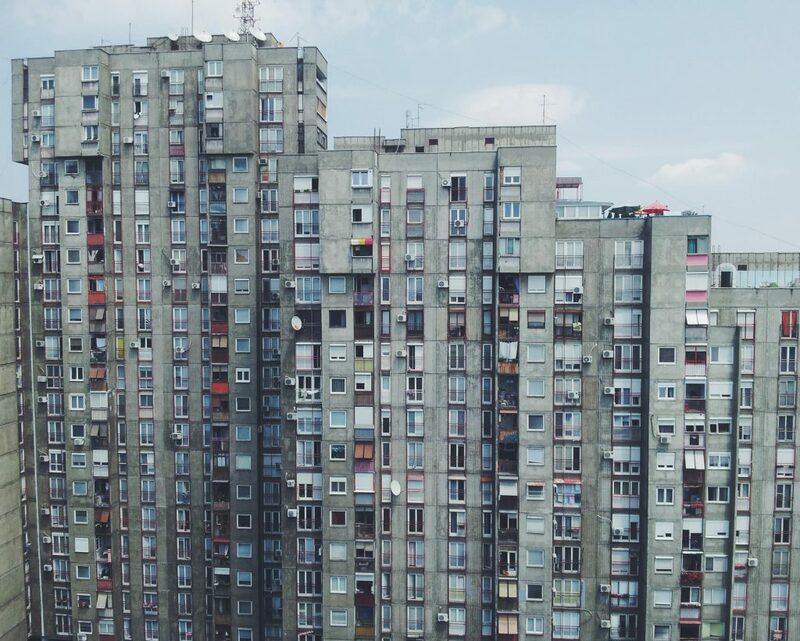 If you’d like to experience what it was like to live in an authentic Yugoslav neighborhood, you should visit the residential part of New Belgrade. This part of the city was built right after World War II. What makes it special is that it’s the only one that was built from scratch by Communists and under Tito’s rule. The previously mentioned brutalist architecture reached its full potential in the residential areas called blokovi (“blocks”). Just like the name says, they are simple and clean and look like tall blocks of concrete, especially from afar. Therefore, it’s difficult to find your way around them, so make sure you ask a local to help you out. An interesting fact is that the architects managed to incorporate the communist ideology in the appearance of these high-rises. They all look pretty much the same, so they’re all equal, just like the members of society. In the way they’re organized, they represent unity and togetherness. Take a walk through these streets and you’ll find yourself in a time machine! To learn more about the architecture of New Belgrade click here.